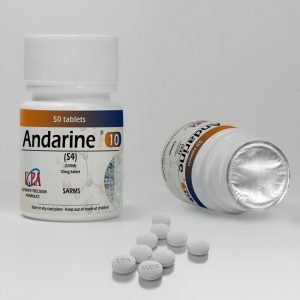 S4 (Andarine) or Acetamidoxolutamide, is a SARM (Selective Androgen Receptor Modulator). S4 is said to be the most potent SARM which helps sustain lean muscle mass while stimulating fat elimination at the same time. Today, we’ll take a closer look on everything there is to know about S4. As said earlier, SARMS function by tying to the AR resulting to anabolic activity. Due to this fastening and stimulation, more protein is produced which allows muscle building. S4 can trigger muscle development in the same way as steroids, but minus the same unwanted side effects, the latter has on the prostate and other sexual organs. S4 is a SARM with utmost androgenic effects as it around 33% of the strength of testosterone when attaching to AR. S-4 also increases the amount of muscle mass produced by desensitizing the AR to the individual’s natural testosterone to influence a stronger effect. Aside from preserving lean body mass, S4 can also help improve it. From a stage 1 study, S-4 has provided evidence of a 3.3 lbs increase in less than 90 days with no increases exercise or change in daily diet. An unintended side effect (or benefit if you will) is the decrease in body fat [Chen et al., 2005; Gao et al., 2005; Kearbey et al., 2007]. Decreases in body fat are dependent on the person’s genetics, but it will definitely have strong effects on the body’s ability to oxidize fatty tissue. S-4 was found to not only have a great affinity (potency in binding to androgen receptors), while also presenting greater anabolic effects than some traditional steroids [Kearbey et al., 2007]. The idea for S-4 didn’t start out as many believe. It wasn’t an attempt to create a safer version of steroids or any of that nonsense people use to sell anabolics. S-4 started out as a new development for male contraceptives and showed some promising effects. There had been decreases in spermatogenesis and an increase in male libido. So for those of you who have had trouble getting your wife pregnant while on sarms…you’re welcome. It wasn’t until researchers discovered how this first generation SARM affected castrated lab mice by not only increasing the production of muscle mass and calcium for bone density, but was also completely selective in its tissue growth. As studies continued, many of these research trials resulted in astonishing outcomes creating a benchmark for even more research. One study in particular compared S-4 to DHT (a common anabolic steroid); the results have shown that S-4 exceeded DHT in producing lean muscle mass over the course of 120 days with only 3mg per day. S-4 has also shown no side effects on prostate growth, testosterone shut down, or any negative side effects caused by traditional anabolic steroids [Kearbey et al., 2007]. Another study identified that S-4 is completely absorbed even at very low doses. The half-life for S-4 is between 2.6 to 5.3 hours. Most people have opted to split their 50mg to 75mg doses into 3 separate doses, one with every meal. This has become somewhat of a dogma but there are now studies proving that it is any more effective than one solid dose once a day [Chen et al., 2005a; Gao et al., 2004; Gao et al., 2005; Kearbey et al., 2007; Kearbey et al., 2004]. Once more, an early study done on S-4 provided proof of full muscle regeneration in volunteers with with degenerative disorders without the use of exercise and the minimum dosage of 3mg/kg/day. Changes can be seen anywhere from 1-2 weeks. This was the very first study classified S-4 as CLINICALLY SIGNIFICANT by improving skeletal muscle strength, lean body mass, and a reduction in body fat [Chen et al., 2005; Gao et al., 2005; Kearbey et al., 2007]. Unfortunately, there are always some side effects that arise when using Because S-4 is a ligand by definition, the side effects will never be permanent even at supraphysiological dosages and can be easily avoided through proper dosing. *Take 2 days off when taking S4 (repeat the cycle after the 2 day break) to avoid vision side effects. 0% chance of aromatization, male breast lactation, or rise in any other female characteristic during the post cycle recovery. Unfortunately, S-4 isn’t the perfect anabolic chemical and does come with some down sides. The first and possibly the most disappointing is that it follows the law of diminishing returns. Unlike anabolic steroids, sarms will become continuously less effective after a certain milligram percentage. For the average person it ranges from 50mg to 75mg. there are people that can go above this range for even more amazing results or need to stay below this range because they are unable to tolerate the chemical. About 99.5% of the population should fall within the 50mg to 75mg range.